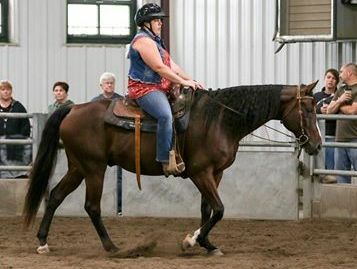 Dudley was foaled in 2001, and is a 15.3hh bay appendix quarter horse gelding (registered name North Sea Dancer). We were called out to a farm to pick up Dudley and the mare who was his pasture mate. The mare was unfortunately suffering from chronic medical and lameness issues that were beyond treatment. 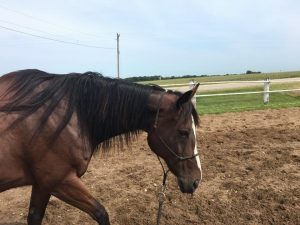 She was down and suffering so we elected to humanely euthanize her on the property (thank you to Dr. Frederickson of Sunrise Equine Veterinary Services for meeting us out there… and giving this mare immediate relief from her pain and suffering). We want to thank the owner of these horses for doing the right thing in calling us and surrendering them to us. 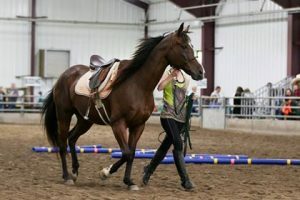 She had recently received the horses after the original owner passed away and, not being a horse owner previously, did not have the knowledge or ability to care for them. Dudley had little handling at intake and had some pretty big trust issues. 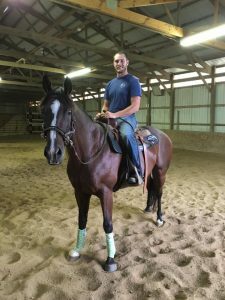 He spent the summer with trainers Alyssa Bates and Kayla Michael and competed successfully in our 2016 Trainer’s Challenge of the Unwanted Horse. 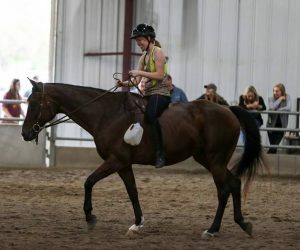 Dudley has a great solid training foundation under saddle thanks to Kayla and Alyssa. He then went to Wrisky Ranch in Prescott, WI, where he continued his training while in foster care (thank you to everyone at Wrisky Ranch!) 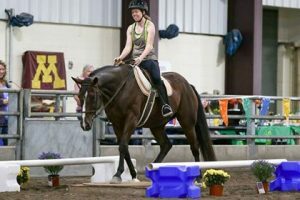 As of February 2018 Dudley is back in Minnesota and is now continuing his training with Marirose Berner. 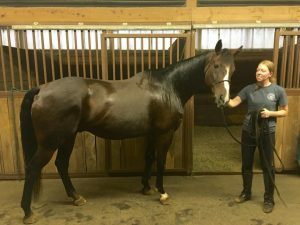 This big, sweet gelding would love to find his very own person! You can see Dudley’s new Facebook page w/ Marirose Here!